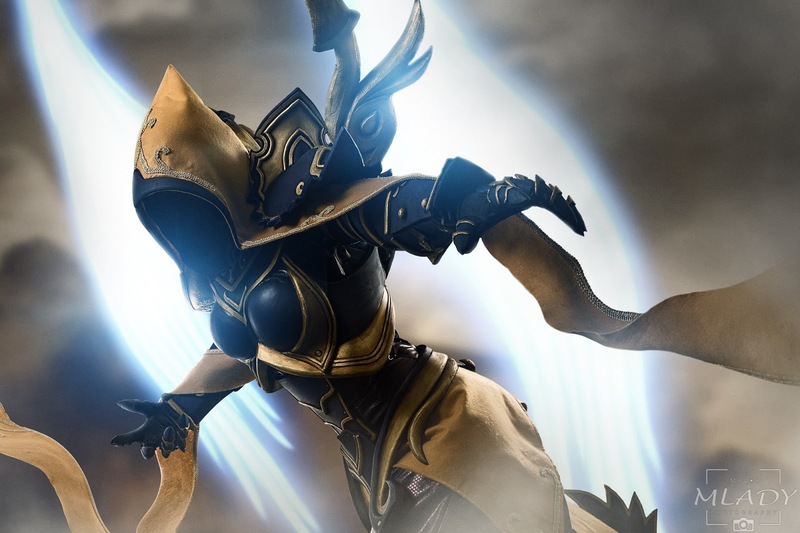 Auriel is one of the few support heroes in Heroes of the Storm, that can have a great healing ability and in the meantime deal a lot of damage. 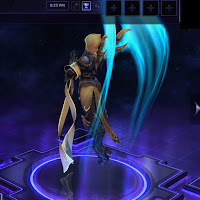 It is a versatile choice for someone like me, who wants to be useful for the team (support) and enjoy the game by myself by killing the opponents (offense). I simply fell love with the character. 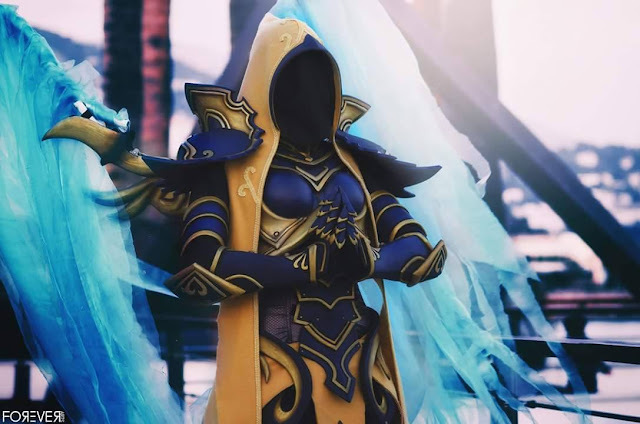 From the cosplaying point of view, she is just perfect. 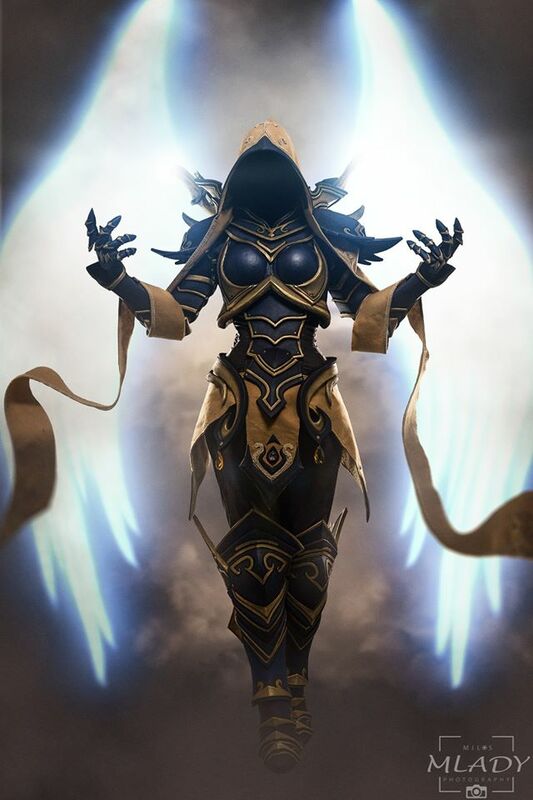 She has majestic wings, that are really challenging to be well made and organicly flowing like in Heroes of the Storm (the Diablo version makes her wing white and flowing to all sides), she has full armor and a lot of sewing work for her bodysuit, cape and skirt with a lot of embroidery. 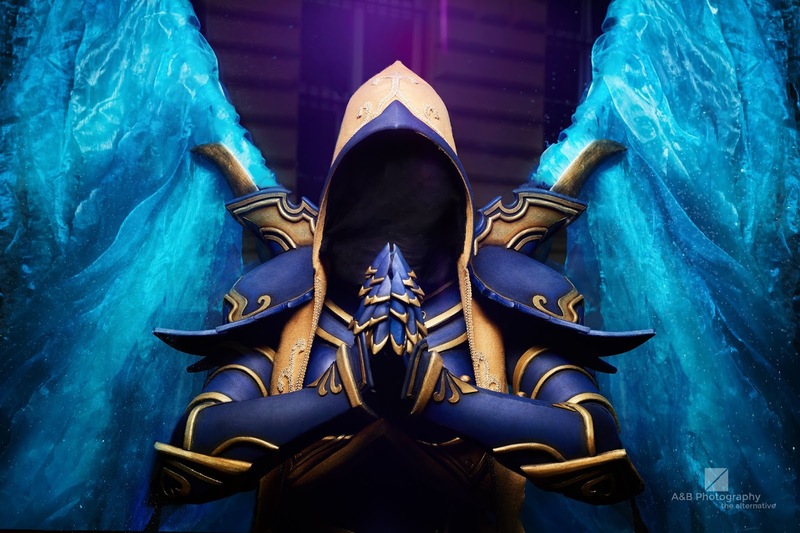 She offered few challenges, with covering her face to be able to see, over making her wings articulated so it can be transfered by plane to embroiding the fabric and fitting all the fantasy armor pieces well together. 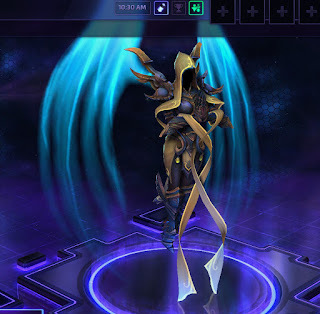 From the look of this Auriel skin in the game, I decide to go fo the blue-yellow version of her, since I really disliked her white-greenish-gold combination. 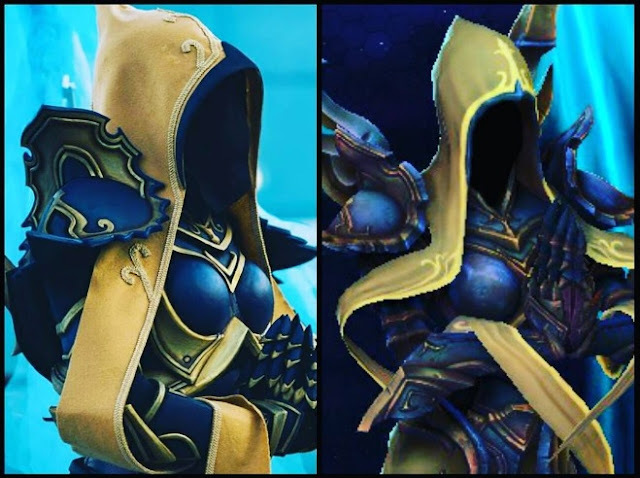 I was going for the matte look of her armor, since it doesn't really look shiny at all in the game. 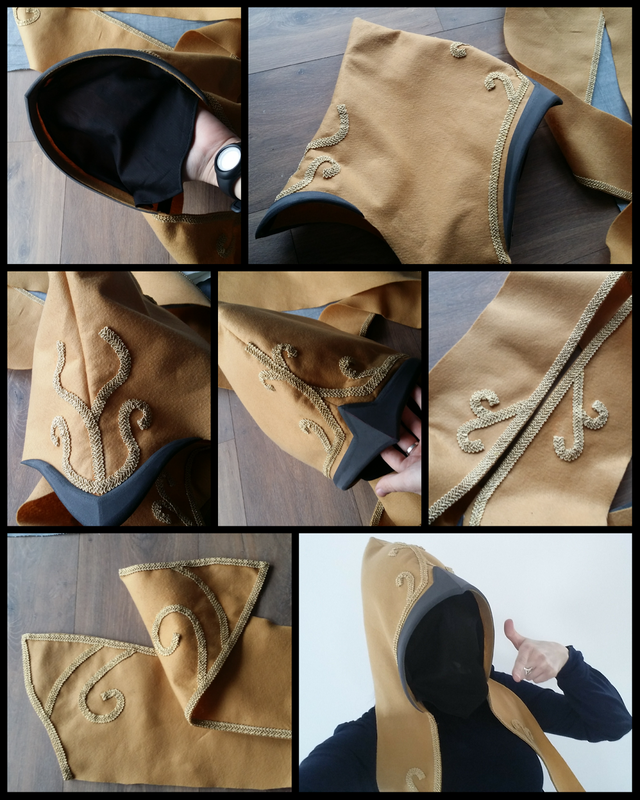 I'll just show you some pics of my pattern and how I made them, but more about how to make patterns in my patterning article HERE. 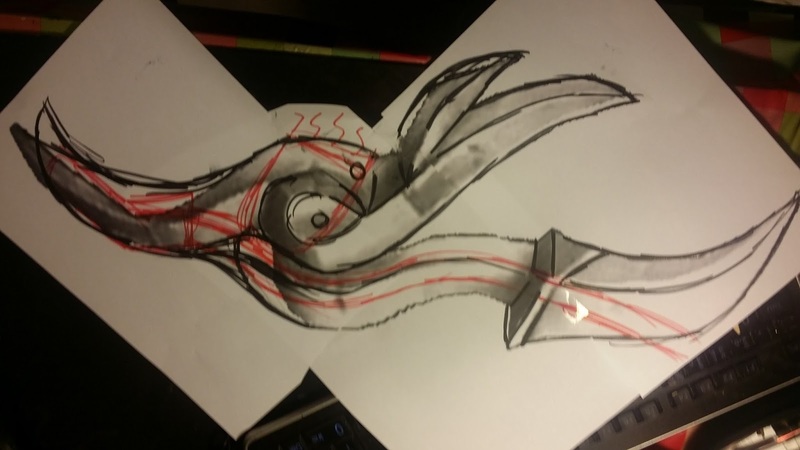 Most of the time I freedrawn the patterns on the paper and tried them on my body or figourine. 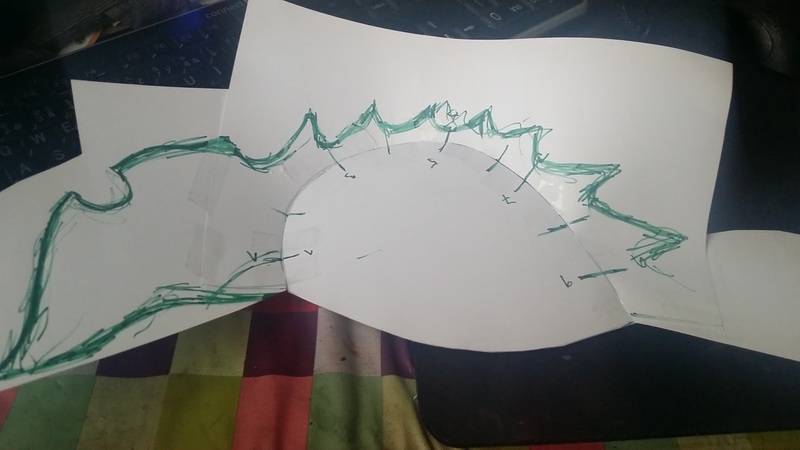 For the wing covers, I cut the picture of the wing from the game in Gimp free graphic software and printed it out in scale to have a perfect referrence. Auriel's bracers have really special shape and it was really hard to get all the details from the referrences I had, so I had to improvise a little in matter of shape and decorations. I thought of very elegant shape, that required the bracer to be made from 4 different parts.I glued them together and left one side open for the velcro connection. I trasnfered my paper pattern onto the foam (using poly-props.com/craftfoam 0,5cm), cut it with exacto knife and glued with chemoprene extreme glue. I decorated it with an arrow piece, that covered my wrist and part of my hand and I used 0,5foam and 2mm moosgummi for all the borders and small flowery decors. 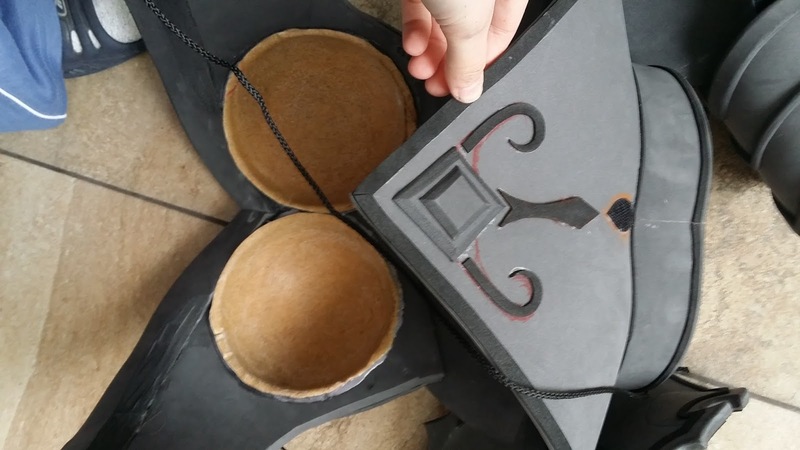 I addedtwo leather straps decorated with foam, that go over the velcro connection of the bracer. 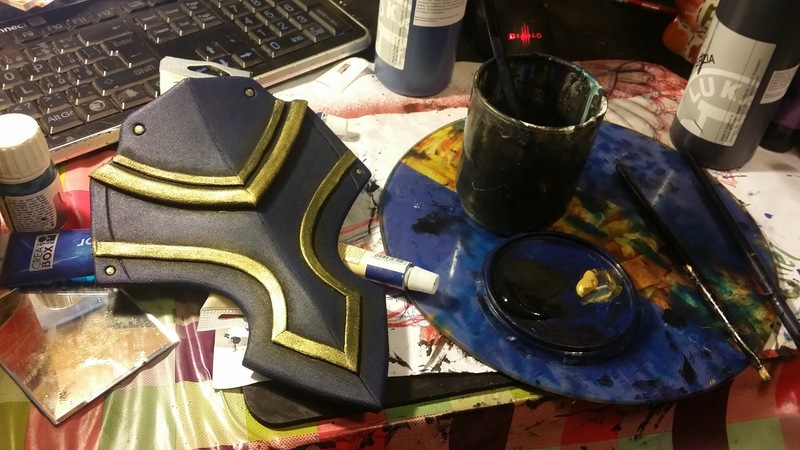 I painted it with black matte acrylic (LUKAS), then I mixed few different shades of matte blue acrylic colors from Lidl and all the borders are painted with 2 shades of Pebeo gold.- I used those colors for the whole build and for some gold shading, I also used brown. 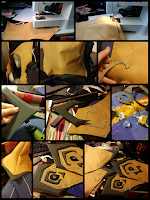 For the gauntlet base I bought just simple long black ball gloves from e-bay and made a paper pattern for the gauntlet parts, that you CAN DOWNLOAD HERE. 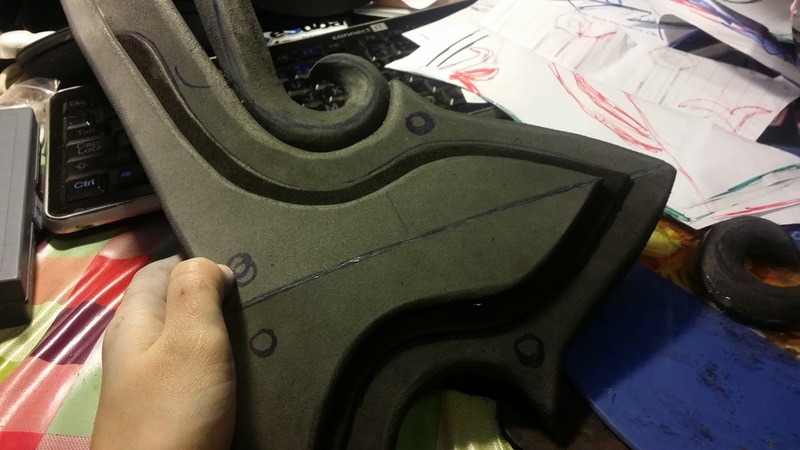 According this pattern I connected two layers of black worbla to make it stiffer and cut it according my pattern. 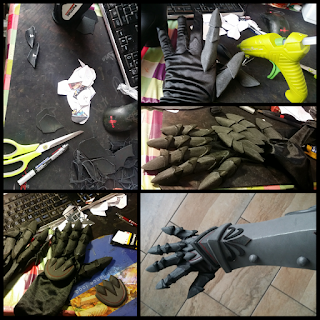 For the palm part I've used 0,5cm EVA foam from poly-props.com. 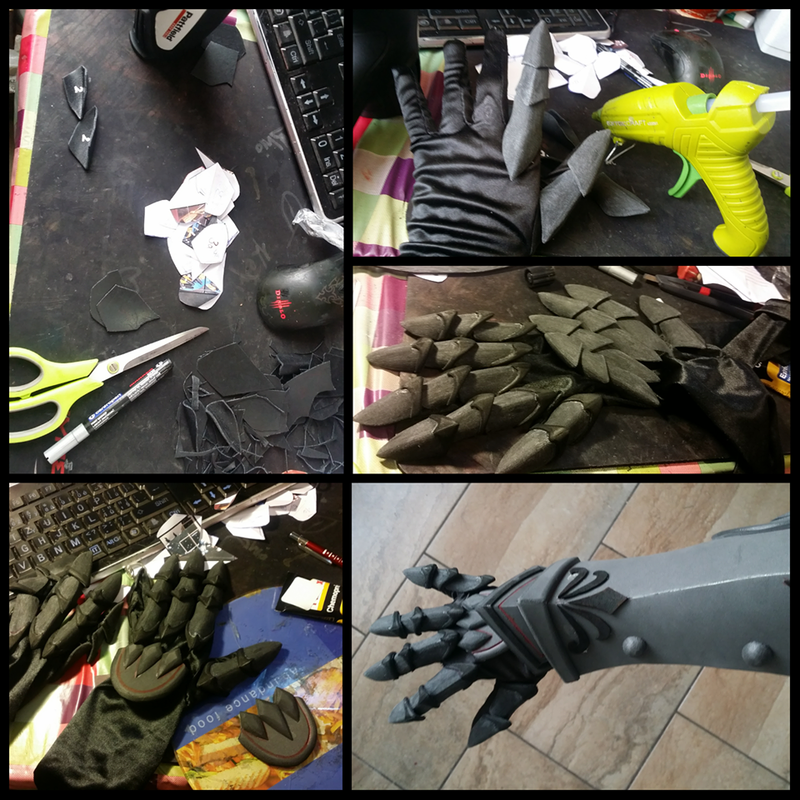 I heatformed the worbla around my fingers and glued it with hotglue to my glove. I made moosgummi decorations on top of it and it was ready for painting. 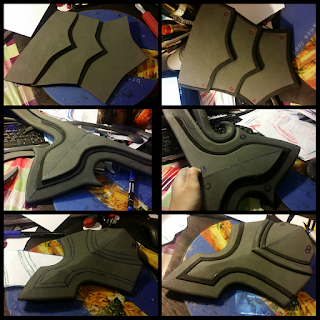 I painted it the same as other pieces (see Bracer). The boots are really high an are decorated with wings. 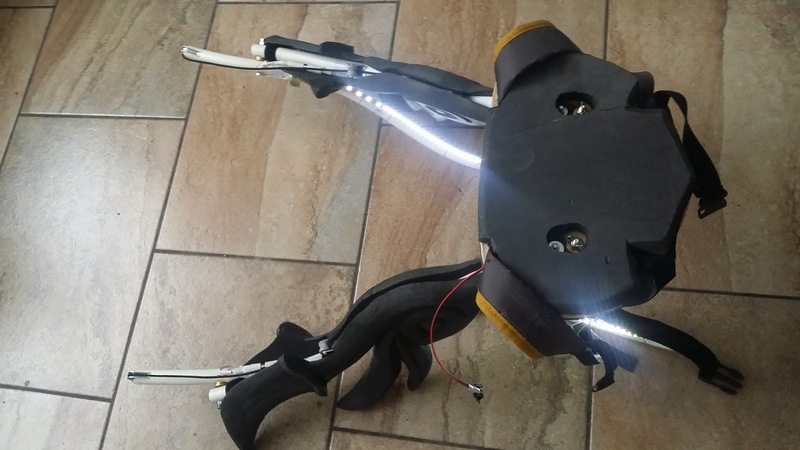 They are quite bulky and kinda uncomfortable to walk (she's flying, right). But since she is wearing high heels in the game. 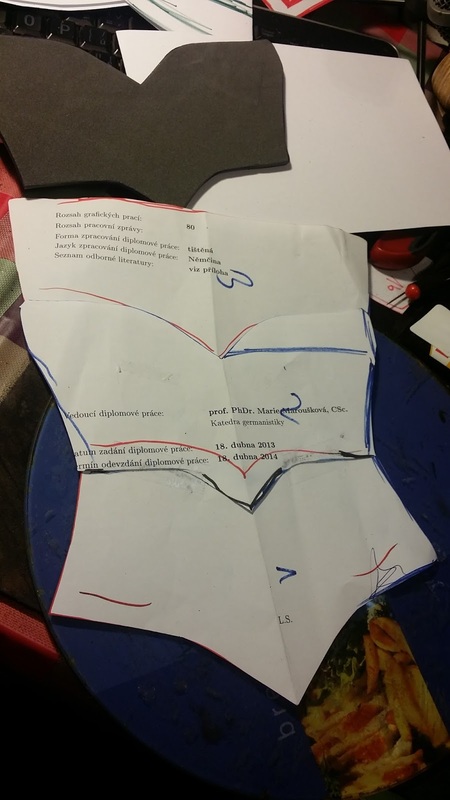 I've used high heeles leather boots, that go under the knee and I made paper patterns on them in shape of the boot. 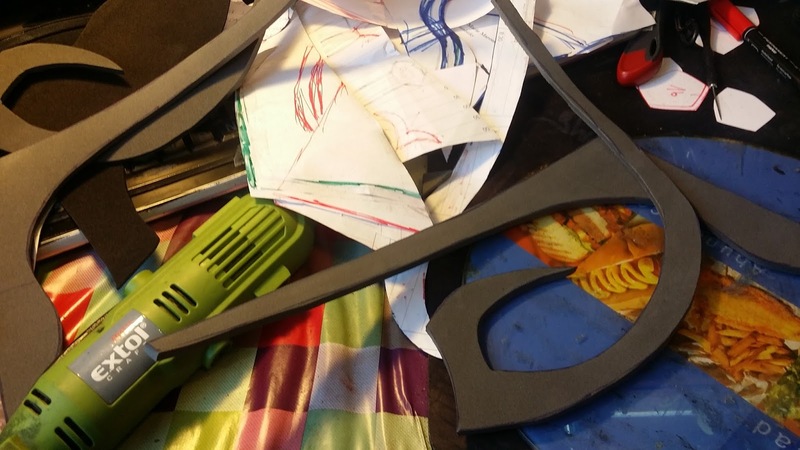 The top of the boot are just rectangular pieces glued on eache other, then it required more advanced patterning in the ankle part of the boot and the boot is connected under the shoe with 3 velcros and around my heel and ankle from the back also with velcro. 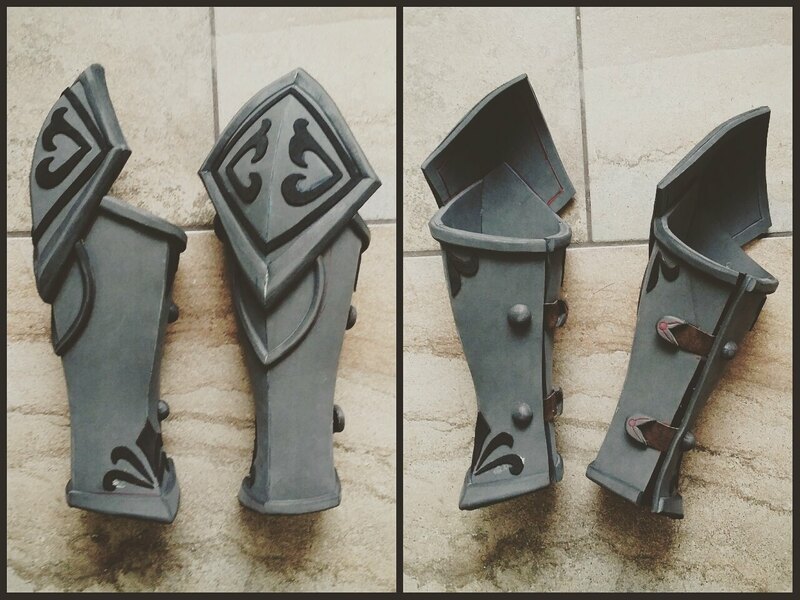 Then I made four-part shin guards (similar to bracers but bigger) with heel covers, that connect with velcros to the boot and glued knee part onto it. 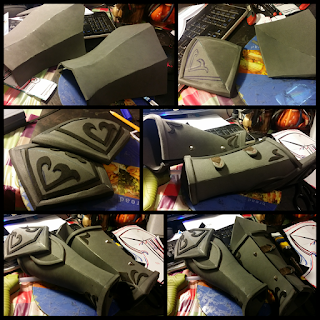 The patterning was made from few rectangles and two round peices similar to the pieces for pauldrons. 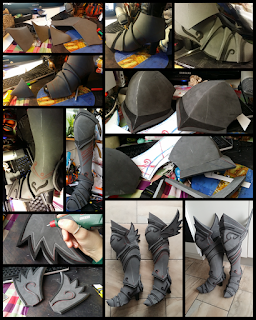 I decorated it all heavily with moosgummi (0,2-0,3 cm thick) and some parts are decorated with 0,5 cm foam and engraving tool. 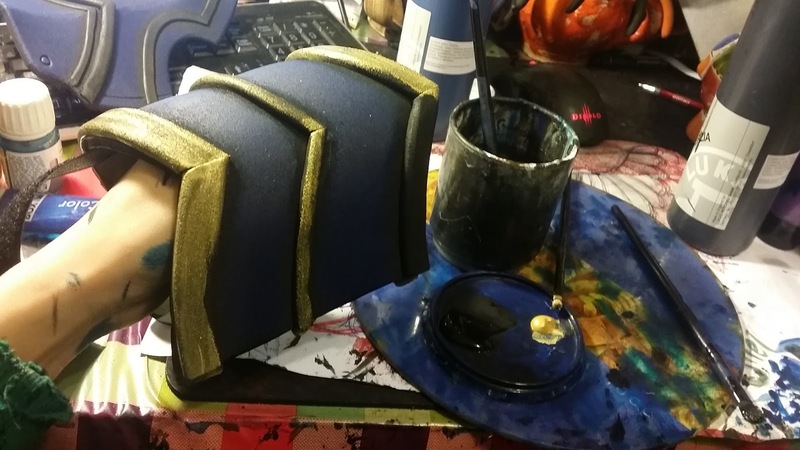 I painted it with same colors as bracers. I started with boobcups, that I made from 2 connected layers of normal worbla and heatshaped it around an acrylic ball, sanded it down and glued it to the foam base made from 1 cm thick EVA foam, added small borders from 1cm foam and side covers from 1cm foam and the bottom border from 2 layers of 1cm foam.Then I added collar piece that goes around my neck from 1cm foam. 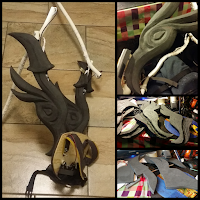 The collar piece was made from 3 layers and it connects on the back into tha backpack with velcro. 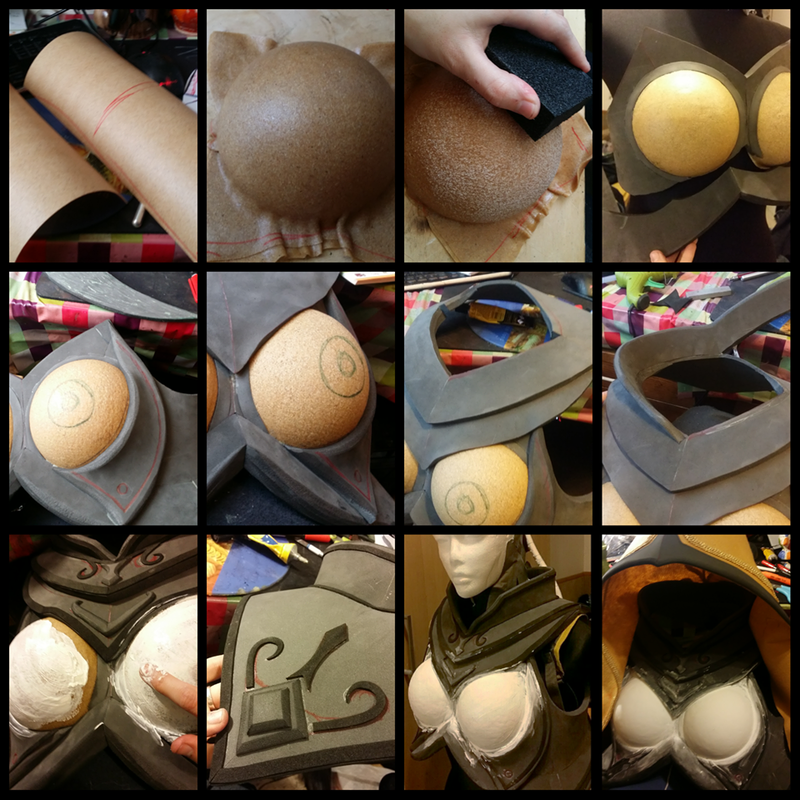 Then I decorated it heavily with moosgummi and 0,5 foam and smoothened out my boobcups with latex cement and water. The part that goes around my cheest is connected with velcros to the inner part of the backpack piece. 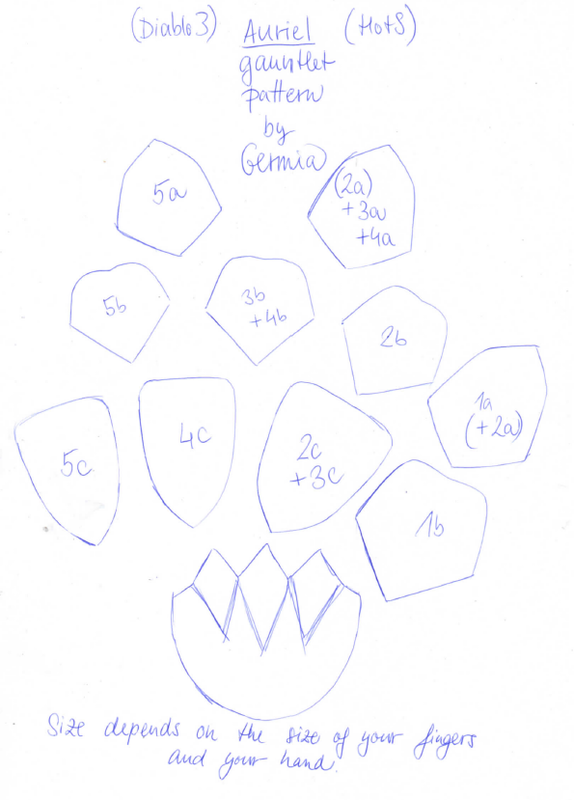 I designed the pauldron only from two round pieces with spiky border. 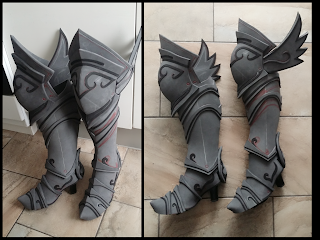 I made them from 1cm foam and decorated with engraving tool, moosgummi and 0,5 foam. 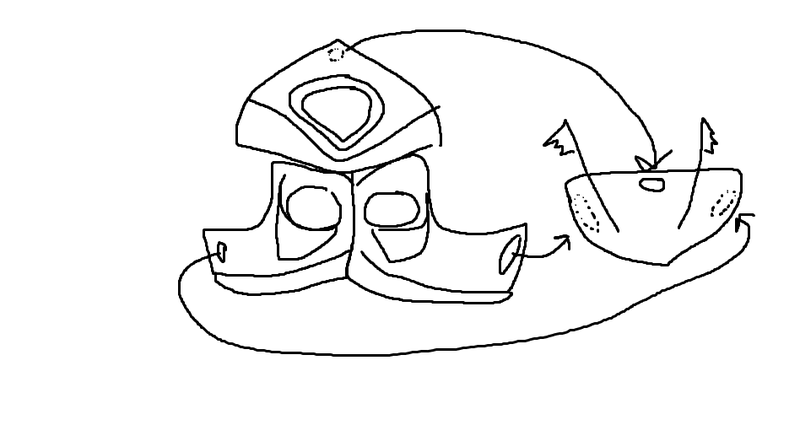 It is connected to the collar with velcro pieces and with another velcro piece to the biceps armor. 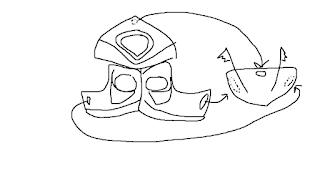 Biceps armor is just a piece of foam connected with velcro together in a wave shape decorated with 0,5 foam dremmeled into round shape.. 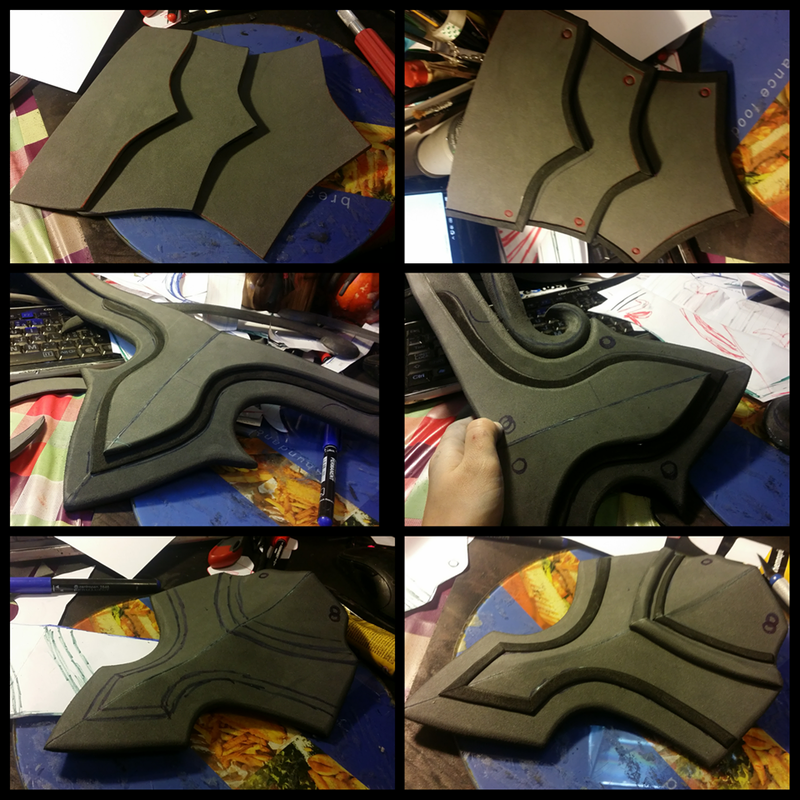 The base for all those pieces was EVA foam. 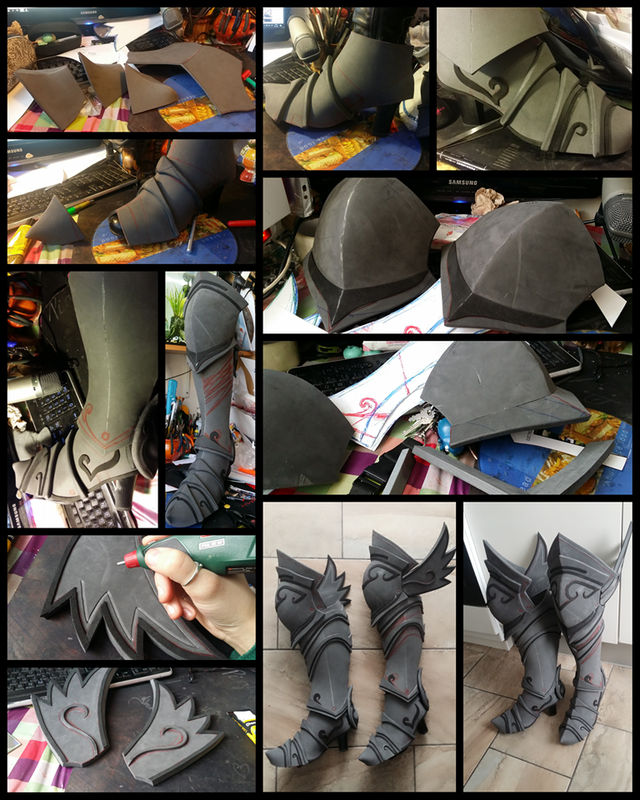 For the belt it was 1cm foam and for the front armor and belly armor it was 0,5 foam. All the pieces are decorated with moosgummi and/or 0,5 foam. and some rivet shapes are engraved with engraving tool. 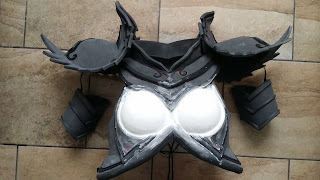 The whole construction connects with velcros to the corset (belly pieces with 4 velcros, other pieces connect to the skirt). 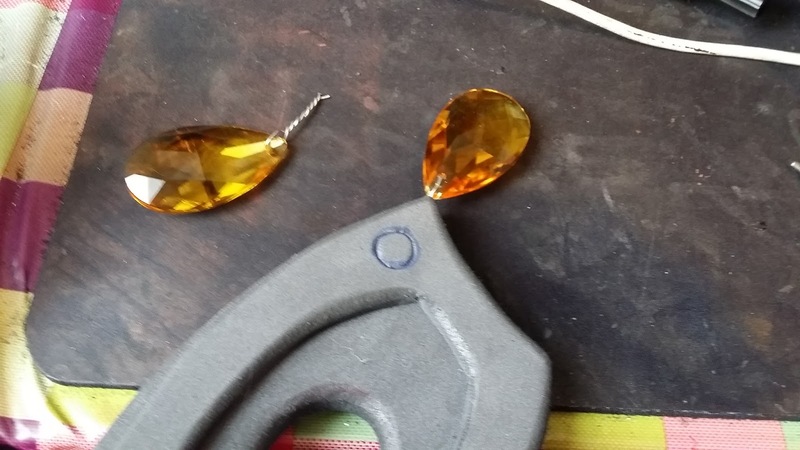 For the crystals in the fron of the skirt, I've used dark yellow chandelieur glass teadrop faceted beads, I put a wire through the hole in them and inserted the wire inside two layers of foam and fastened it with hot glue inside. 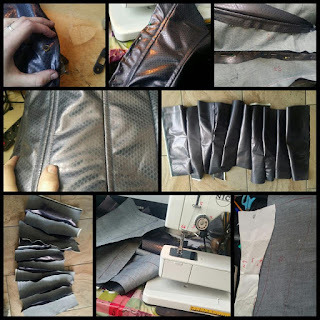 8) Corset and trouser piecesI wrote a whole article about corset making HERE if you're interested! 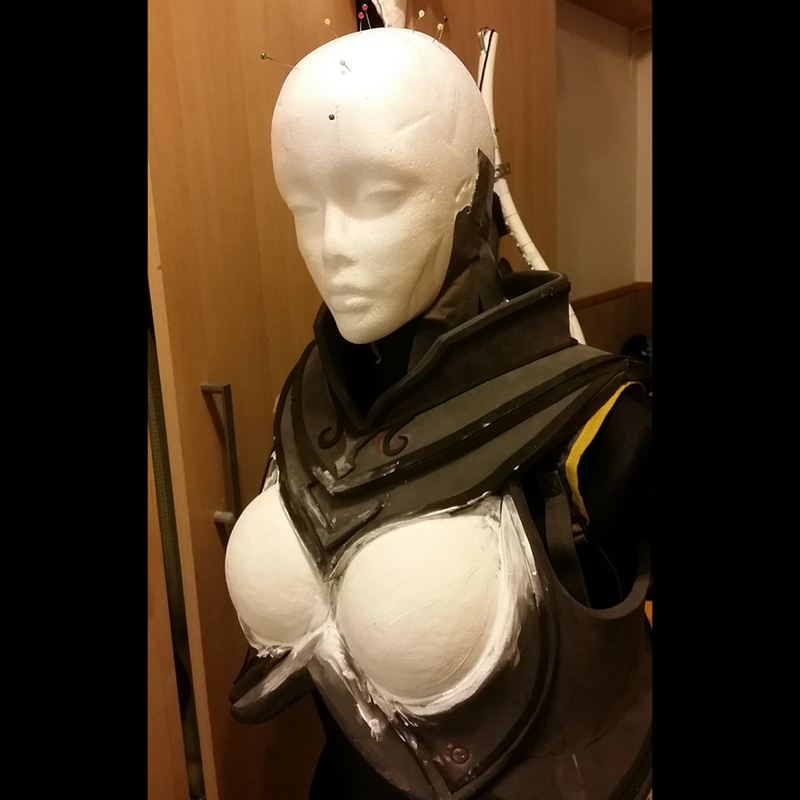 I made the trouser pieces and the corset from denim fabric with metallic print, that remind me the most of the fabric on Auriels bodysuit. 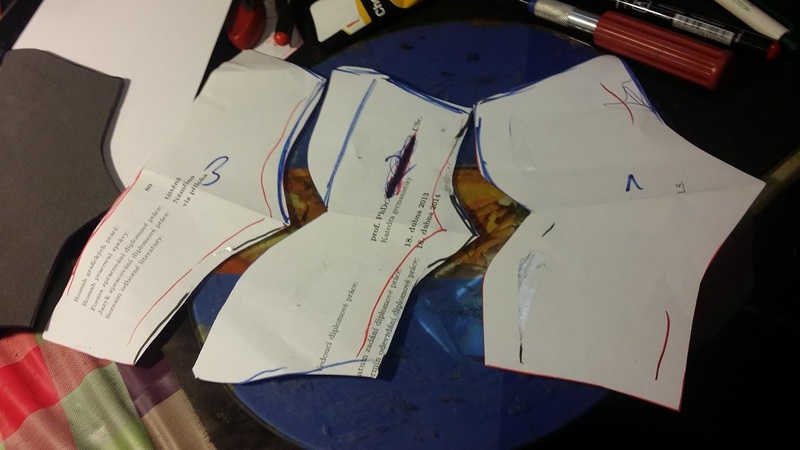 I've designed my own pattern on a paper and transfered it onto the fabric. 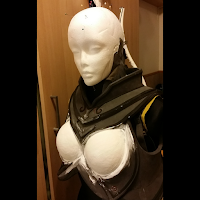 I cut the fabric, sewed it together and sewed the around 1cm thick line around the seams to make a small compartment for the plastic corset reinforcements. I made holes on the back, that I reinforced with special metal holes. 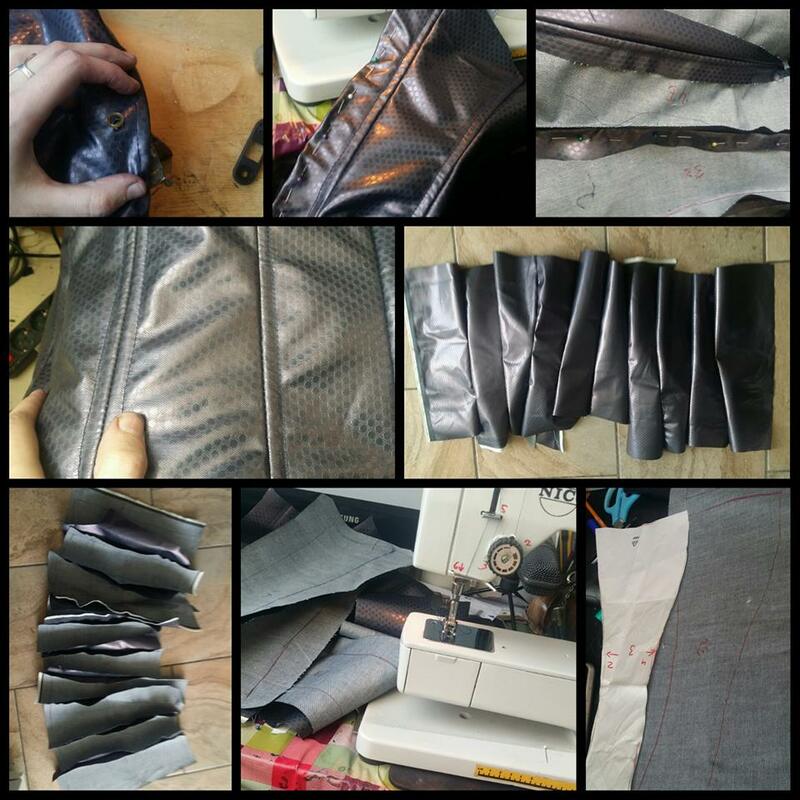 Then I just sew around the corset to hold the reinforcements inside it and prevent the fabric from ripping itself. 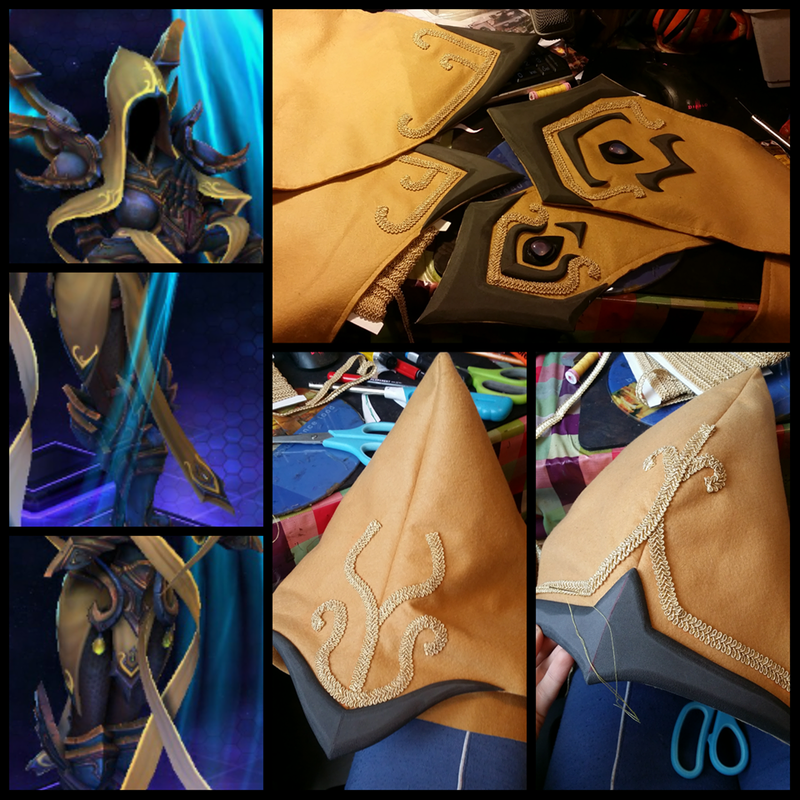 Then I sew velcros for the skirt to hold, for the trouser pieces and for the belly armor. I've started with the pattern I made from paper and transfered it onto the dark yellow-ish fabric I've chosen according the referrence pictures. It is a woolen stiff fabric. 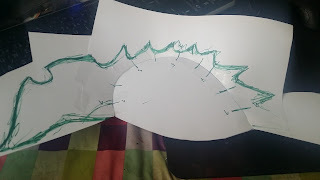 I cut two pieces for the front and back of the skirt, two big triangles for the left and right side and two rectangle pieces with looooong straps for the cape. The skirt is all double layered for better stiffness and I sewed both parts of the cape together. I made decorations from 0,5 foam and dremmeled them into perfection and colored them blue.Then I emroided this whole stuff by hand on both sides. I also inserted little rainbow gemstones called Opalites in the front and back of the skirt. I made a base for it from moosgummi, glued the stone with chemoprene glue to the base and fastened it with moosgummi strap wrapped around the stone. The cape and the skirt hold on their place with velcros. Skirt with velcros on the corset, cape is fastened to the collar on the sides and back. I made also a veil, that covers my face. It is a light blac fabric, that is woven very rougly, so it has a mesh structure, that is see-through from the point of view of the wearer, but black from the pint of view of others. It is sewn inside the cape on one side, on the other side, there are velcros, so I can open the veil and eat or drink or talk. The wings were really hard to make since I wanted them to fit in my luggage. I decided to make them from 2 pieces, that would allow them to move. 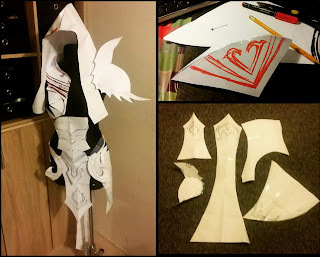 I started with a plywood base, that I cut into the shape of the backarmor Auriel has. 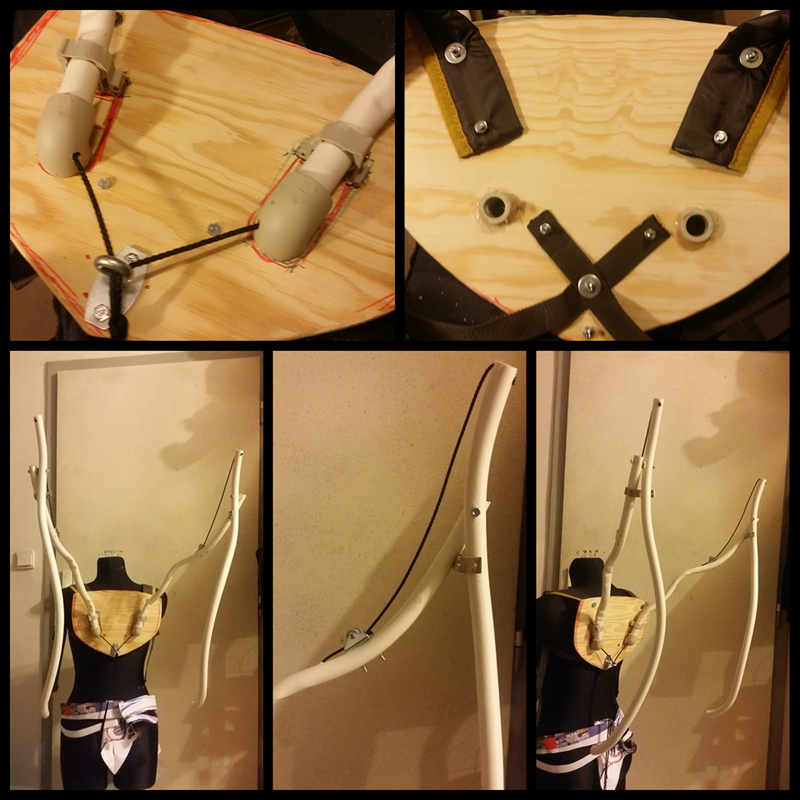 I made a hole into it, where I inserted a plumbing knee-joint and glued it with hot glue inside. 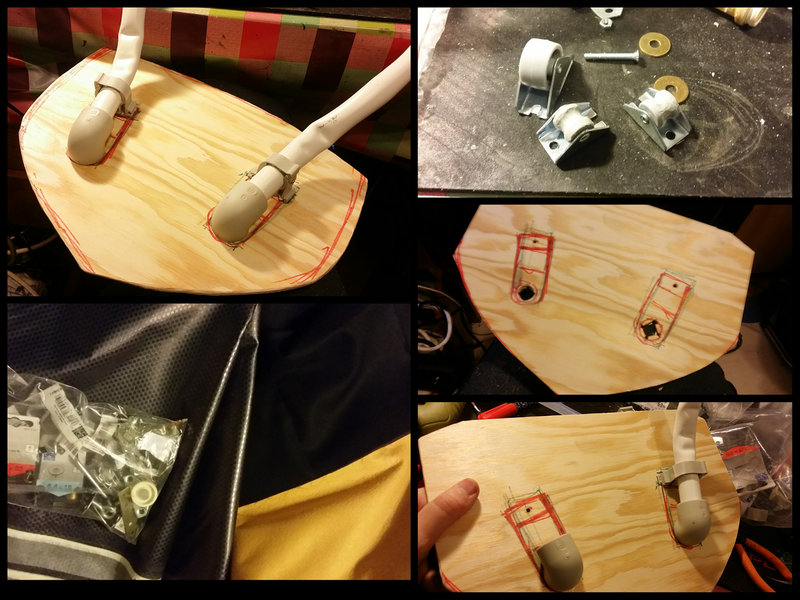 There is also a plumbing clip there screwed inside the plywood to hold the wings on it's place. I formed Apex aluminium tubes into desired shape and lead a cord through the tubes. I fastened the cord on the end of the tube and led it through a pulley made from a furniture wheel. I connected both tubes together with a long screw with brass pads. 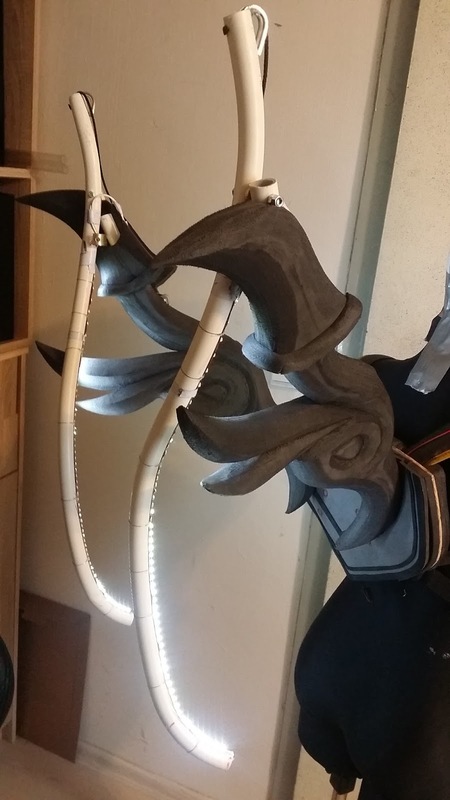 The cord goes through the whole construction and allows the wings to be pulled downwards behind my back to bring the wings in motion. I first thought about a construction with a lot of pulleys, but decided to go for a simple ride. 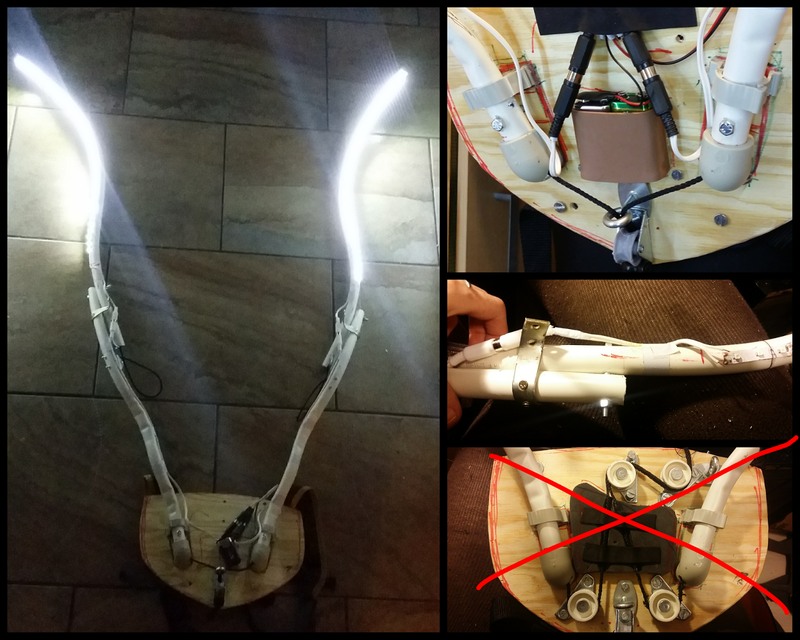 I also inserted wires, that will connect the battery to the LED lights glued to the second tube. The switch goes through a hole in the base and is sewed inside the backpack strap. 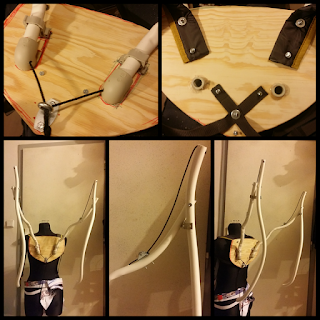 I took the backpack straps from a cheap backpack and glued and screwed them to the plywood base. 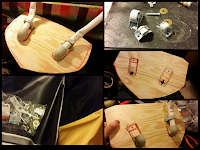 The tubes hold in place because of two screws - one going through the tube and plywood between the plumbing knee and clamp (prevents falling of the tubes from the base), second goes through the clamp and through the tube (prevents turning of the tubes). On the end of the cord, I always attach a plastic doublepin (used for hoodies to adjust the lenght of a cord going through a hood) and make a knot on the end. With pulling the cords and moving the plastic pin you can adjust how high the wings would be. The pin then holds them in place. When the construction was done, I had to make it more beautiful and cover all construction parts. 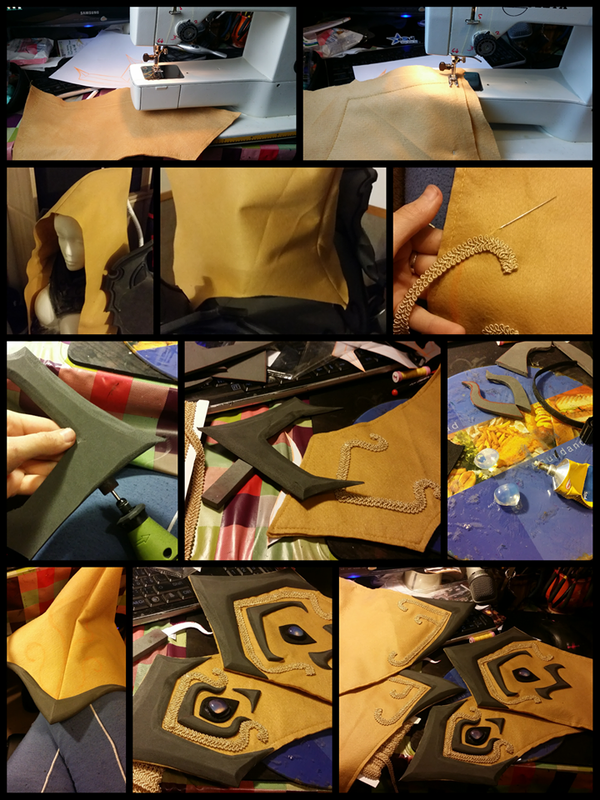 I started with the backpack, Where I glued a thick low-quality foam inside to be more comfortable to wear. 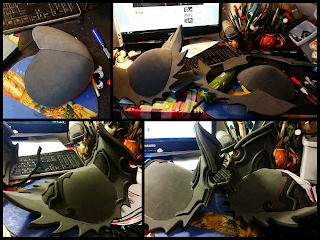 Then I glued 1cm foam pieces around the whole construction and onto it I glued a solid part from 0,5 foam decorated with moosgummi. Then I photoshopped the solid part of the wings from the referrence picture and made a blueprint in my computer with the help of freeware graphic programm Gimp. 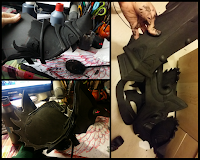 I trasfered the blueprint on 4x 2 layers of 1cm foam, I cut it, dremmeled the inisde for the tubes to go in I glue part of it together and part of it left open and glued only velcros inside, so it could be dettachable. Then I dremmeled it into the right shape (omg the mess from the dremmeling was horrible). Then I painted with acrylics. I wanted my wings to be very organic and very light. I've never seen realistic Auriel wings and I think the magical effect of them i really hard to make. 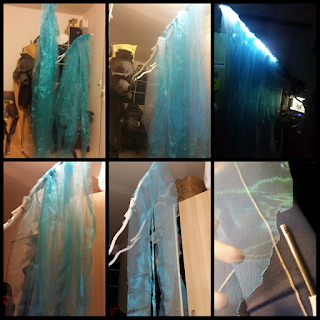 I tried it like that: I installed the LED light strips on the upper tube and glued around 15 meters of different shades of blue organza straps, that I had to cure with fire or else it will rip on the borders and leave a lot of mess. 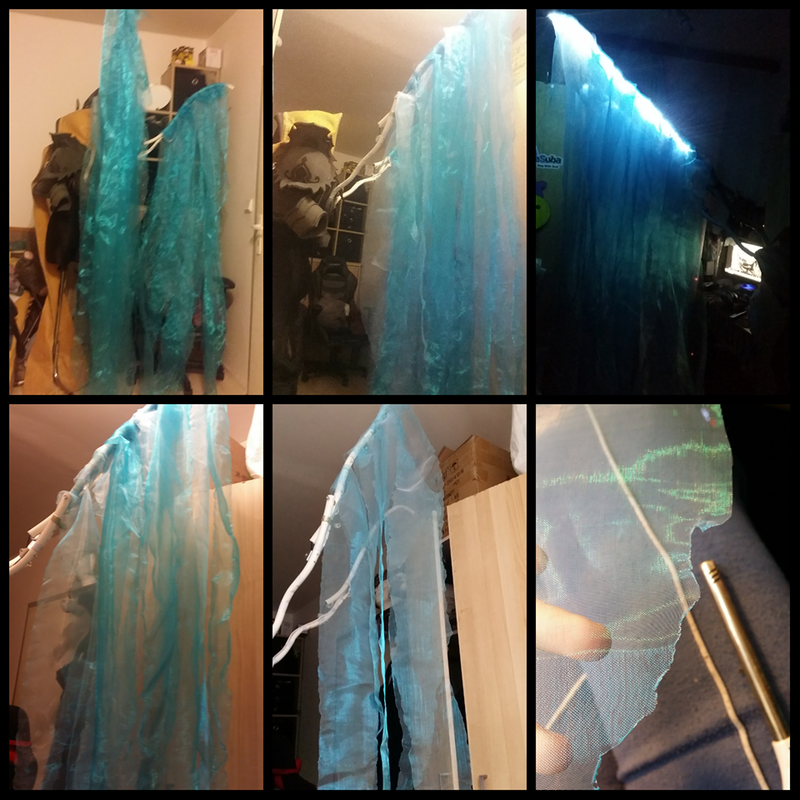 I used hotglue for gluing and I tried to mimic the shape by using different shades of blue and different lenghts of the organza. 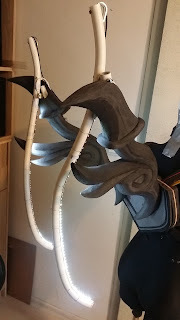 The result is quite satisfying, but if I would do that again I would use a different way of lighting the wings up, since the organza fabric doesn't lead the light as I expected it it would. 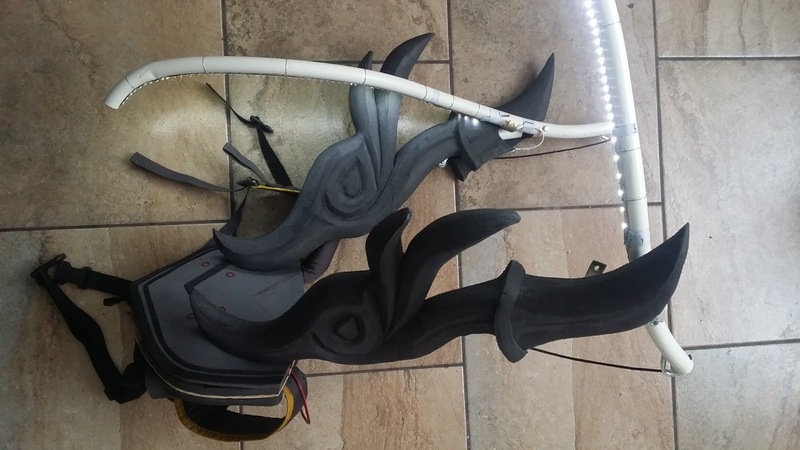 The wings can be also disassembled to fit in the suitcase just by unscrewing some screws in the base, disattaching the foam covers, packing the organza strips and pulling the cords out of the construction.